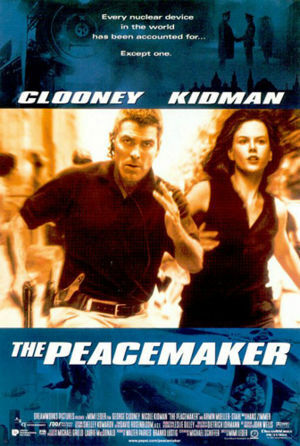 The Peacemaker is a 1997 thriller starring George Clooney as a US Army Special Forces colonel and Nicole Kidman as a nuclear weapons expert who work together to locate a trainload of nuclear warheads that have gone missing following a nuclear detonation in Russia. The Peacemaker was the first feature film directed by Mimi Leder (Deep Impact) and the first feature to be released by Dreamworks Entertainment. 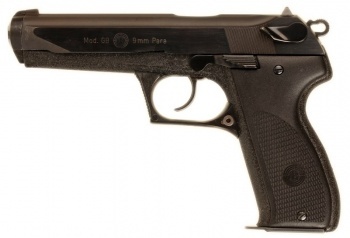 The Beretta 92FS is the sidearm of Lt. Colonel Tom Devoe (George Clooney), USAF pilots, NYC police officers, and several other characters. "Now, I'm only gonna shoot you if I have to, and if I have to, I'm gonna feel really bad about it." Devoe holds the Beretta on Dietrich Schuhmacher. Lt. Colonel Tom Devoe (George Clooney) attaches a suppressor to his Beretta as he threatens the accountant for the computer. After firing his Beretta, Devoe gets yanked back into the cargo truck by Gen. Kodorof. The USAF helicopter pilot (Thom Mathews) holds the Beretta. Devoe and federal agents draw their Beretta's. Devoe holds his Beretta 92 on Gravich, showing a good two-handed grip. FBI agents are seen drawing Astra A-100 pistols during a confrontation at JFK airport. 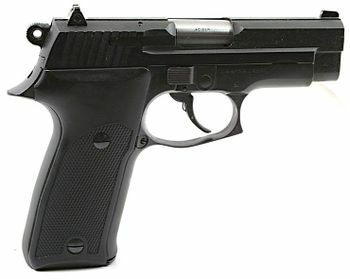 The Astra A-100 was most likely chosen due to its similtarity to the SIG-Sauer P228, the actual FBI-issued sidearm. FBI agents draw their Astra pistols on the far left and right. The pistol is seen on the left. 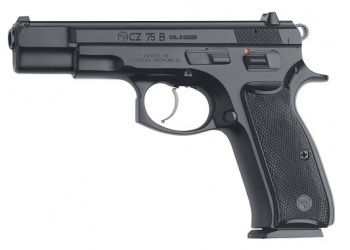 The CZ 75B is seen being used by several characters throughout the movie including Stevo (Slavko Juraga) and Dusan Gavrich (Marcel Iures). Closeup of the suppressed CZ-75B aimed by Stevo (Slavko Juraga). Kodoroff (Aleksandr Baluev) chambers his pistol. 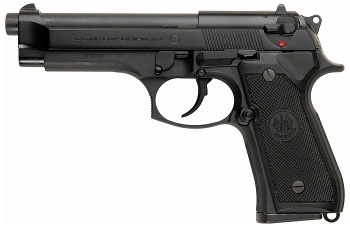 Note the rounded trigger guard and stepped slide identifying it as a "Pre-B" Series CZ-75. 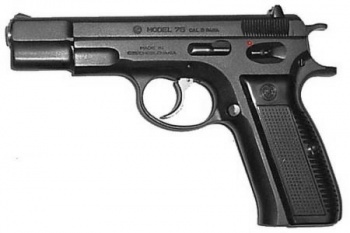 The hammer is not ring style like that of a CZ-75B either. Dusan Gavrich (Marcel Iures) with the pistol. Dusan Gavrich (Marcel Iures) puts the pistol to his head after being confronted by Devoe. The Glock 17 is seen being used by a member of the security team chasing Devoe in Austria. Several law enforcement officers in New York are also seen armed with the Glock. 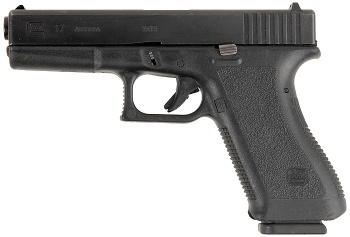 The Glock 17 is seen being used by a member of the security team chasing Devoe in Austria. 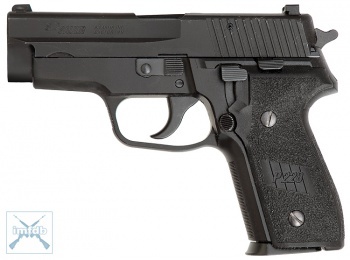 The SIG-Sauer P228 is carried by various law enforcement officers in the film. An NYPD officer (Jay Acovone) draws his SIG on Dusan Gavrich (Marcel Iures). General Aleksandr Kodoroff (Aleksandr Baluev) uses a Steyr GB pistol after hijacking the nukes. When stopped at a checkpoint, Kodoroff pulls his GB and gives a very clear view of it from the side. General Aleksandr Kodoroff (Aleksandr Baluev) uses a Steyr GB pistol after hijacking the nukes. When stopped at a checkpoint, Kodoroff pulls his GB and gives a very clear view of it from the side. M70AB2 rifles are seen in the hands of Russian soldiers as well as some of the terrorists. The rifle is on the far right slung over the Russian VDV soldier's back. Two terrorists have their rifles at the ready as they wait for the border guards to leave. The early (and outdated) Colt CAR-15 assault rifles (some mounted with M203 launcher attached) are the primary rifles used by the Special Ops Force soldiers that accompany Col. Devoe (George Clooney). Colt Model 653 with M203 grenade launcher - 5.56x45mm/40x46mm. The soldier next to Devoe (George Clooney) holds a CAR-15. The guys disembark the helicopter, one with a CAR-15 and an M203. An FBI agent is briefly seen in the elevator is armed with a Colt CAR-15 that's fitted with a Laser Products (now SureFire) 9P flashlight. Commercial CAR-15 semiautomatic Rifle - 5.56x45mm. This is strictly a semiautomatic civilian copy of the XM177 style of rifles. The FBI agents reveal a 9mm Colt, a CAR-15, and a Ithaca M37 in the elevator. The CAR-15 in this shot appears to have a SureFire flashlight mounted on it. Several New York National Guard troops show up to aid in the finding of the bomb, carrying the older M16A1s. This is a correct prop for the National Guard Troops given the time this movie was made. M16A1s were being issued to National Guard Infantry units as late as 2002. There are probably some Guard units that still have them today. National Guard troops disembark their cargo truck, M16A1s in hand. After Devoe gets 8 of the nukes, an SOF soldier is seen slinging his M16A2. An SOF soldier on the right slings his M16A2. (Also a pretty good shot of a MP5A3 too). A Special Forces sniper is armed with the M24 sniper rifle. The weapon also has a custom camo paintjob (albeit fading) and a fluted barrel. The SOF sniper provides cover with the M24 rifle. The rifle's paintjob and fluted barrel is seen here. Ten points for holding the rifle correctly, ten more points for being in the Army's sitting position. The Sniper sits with his M24 at-the-ready. FBI snipers utilize the Remington Model 700PSS sniper rifles to try to take down the terrorist before he gets to the UN. FBI snipers move into position, Remington 700PSS rifles in-tow. A sniper surveys his area. The FBI sniper (Terry Serpico) gives Devoe a situation report. The Russian soldiers in the beginning of the film use SA Vz.58 assault rifles, which are incorrect as they should be using the standard weapon AK-74M. IFOR soldiers who raid the home of Gravich are also armed with the rifle. The barrels of said rifles are visible over the officer's shoulder. IFOR soldiers who raid the home of Gravich are also armed with the rifle. Two Russian border soldiers are shot down, SKS Carbine rifles in hand. M60D machine guns are seen door-mounted on Devoe's USAF helicopter. The USAF doorgunner mans the M60D as Devoe screams as he rappels down to the cargo truck. The full sized Ithaca 37 shotgun is seen being held by a FBI agent when the team goes to the terrorist’s hotel room. The last of the 'elevator trio' is an Ithaca Model 37 on the right. 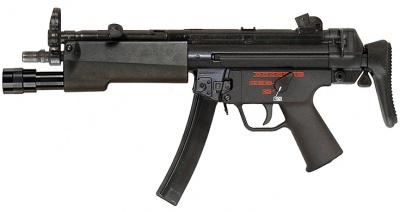 The Heckler & Koch MP5A3 fitted with weaponlights and laser sights is primarily seen in the hands of the US Special Forces, notably Santiago (Carlos Gomez). Special Ops Soldier Santiago (Carlos Gomez) is armed with a MP5A3 fitted with a weaponlight and laser sight. The Heckler & Koch MP5A5 fitted with weaponlights and lasers, a Special Forces favorite at the time, is seen being used by rogue Russian Spetsnaz. Heckler & Koch MP5A5 - 9x19mm with Surefire dedicated forend weaponlight. A Spetsnaz soldier readies his MP5A5. A Spetsnaz stands with his MP5A5 (note the four position trigger group) slung over his back. The Colt 9mm Submachine Gun is seen in the hands of a FBI agent, which is correct for him to be carrying. An FBI agent reveals a Colt 9mm (short barrel) in the elevator scene. A Schermuly Multi-Purpose Gun with the stock removed is seen being used by Kodroff's driver (Dejan Acimovic). He uses it twice, once to blow up a Russian Border Patrol, the again to shoot at Devoe’s chopper, but he shoots the floor of his truck, which blows up, killing him. Kodoroff's driver (Dejan Acimovic) aims the launcher.